This might be the coolest thing you see all day. Precision Rifle Works is developing an adapter for Uzis that allows the user to mount an AR stock and includes an AK side rail. The side rail works perfectly with RS Regulate AK optic mounts to allow a variety of optics to mounted. The adapter currently exists only in prototype form but, once it is tested and finalized, a small production run will be produced. 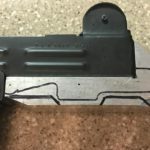 RS Regulate’s new GKR AK MLOK Rail promises to allow AK shooters to keep their heat shields, keep their cleaning rod, and gain QD sling sockets and 17 MLOK slots. The drop-in fit GKR will be available for AKs with or without sling loops. They have been teasing the new rail for a few weeks on social media and they released details at Red Oktober. The GKR is not listed on the RS Regulate website yet but expect to find more details at RSRegulate.com soon. RS Regulate is offering two of their most popular AK side rail mount combinations in some VERY limited edition colors – hard anodized Wasteland or Desolation. There are two mount options: AK-301M + AKML (for Micro Aimpoints and similar) or AK-303M + AKR (for use with scope rings). If you have ever dealt with colored hard anodized finishes, you know that matching colors is difficult. Only these two mount options are available so that the colors can be matched between the upper and lower parts of the mount. Only 50 sets of each combination are available so you will need to act fast if you want one. You can see all of the Limited Edition Mounts at RSRegulate.com. RS Regulate will release their newest AK optic mounting option later this week. The AKOT is a compact ACOG (TA50 and similar) upper optic mount for the RS Regulate AK-300 series mounts. The image below (courtesy of Instagram AK guru hizzie_biscuits) shows the new AKOT in comparison with the AKOG upper mount which is intended for use with full size ACOGs. The AKOT is considerably more compact and weighs in at just 1 ounce. 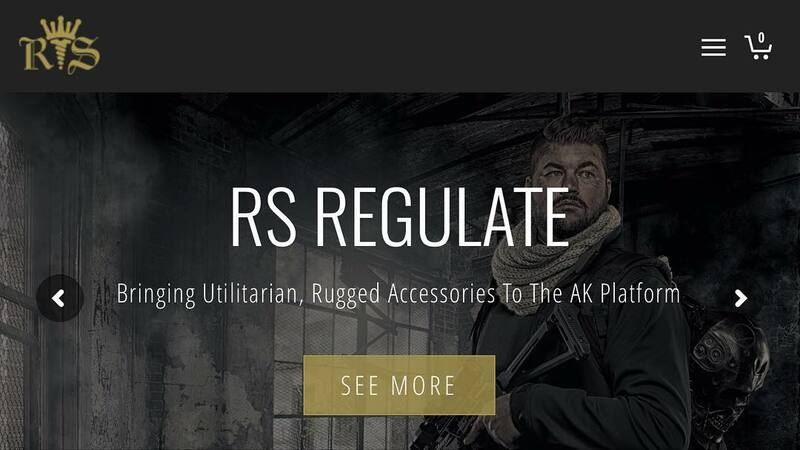 The AK mount gurus at RS Regulate have launched a new website. The new site features improved product images, a more complete catalog, improved navigation, product instructions, and more. Check out the new and improved RSRegulate.com. In a very strange move, Century Arms decided to move to a proprietary optic side rail for use on their line of USA made AK rifles like the C39V2 and RAS47. I guess they figured AK shooters didn’t have enough standards (or lack there of) and compatibility issues to keep track of. On top of the introduction of a new rail, the mounts that they produce for the rail are overly chunky (though functional). Fortunately, RS Regulate is around to rescue us all from propriety rails and bulky mounts. Their AK-300 series optic mounts are completely modular, allowing them to accommodate new rails simply by creating a new lower mount. Their new AK-309M lower mount attaches directly to the Century Arms rail and is significantly lighter (3 ounces) and trimmer than the Century Arms mounts. It accepts all current optic specific upper mounts from RS Regulate and retains the ability to center the optic over the bore. You can learn more about the AK-300 series of mounts at RS Regulate’s website. The AK-309M is not yet listed on their site but it is available from a variety of retailers. 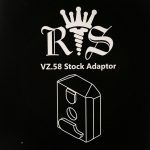 RS Regulate is about to release the VZSA, a stock adapter that is sure to please VZ58 owners. 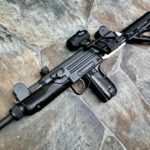 This adapter allows installation of the Magpul Zhukov folding stock on the VZ58 and maintains full safety function when folded. The Zhukov stock represents a massive comfort improvement versus the standard VZ58 folding stock. 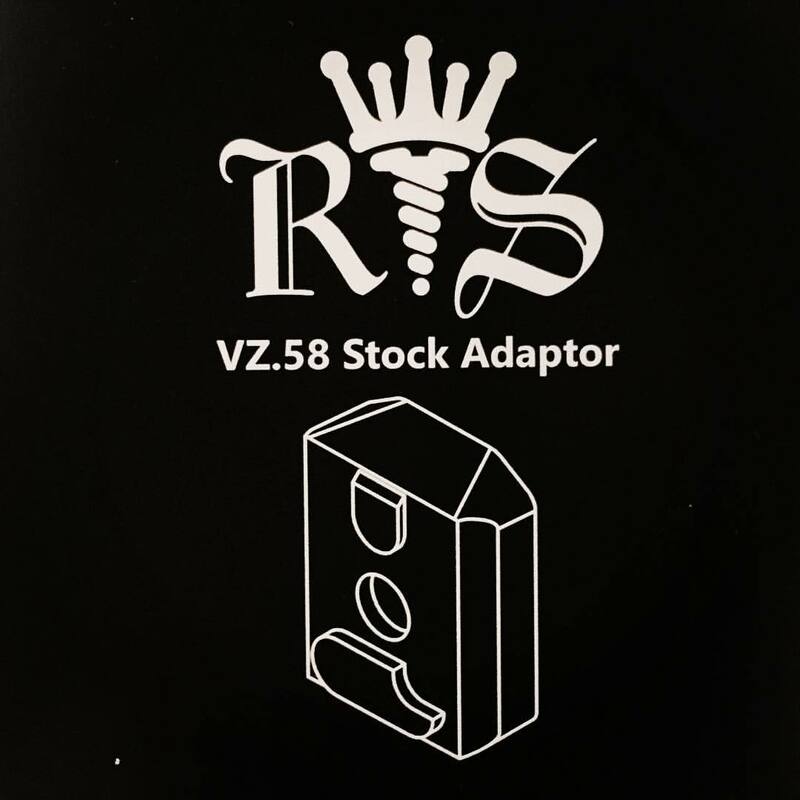 Prototypes of this adapter have already been shown and RS Regulate states that the adapter should be available shortly. Check out RS Regulate. RS Regulate has changed the way I mount optics on my AKs. Their AK-300 series side mounts outpace just about everything on the market when it comes to mating a quality optic to an AK pattern rifle. However, even with their advanced mounts, difficulties persist in mounting magnified optics on AKs. The current solutions tend to have eye relief issues, excessive height over bore issues, or both… not to mention how clunky it can be to attach a large scope to rings which are attached to a mount, which is attached to your rifle. That is where Browe comes in. They have worked with RS Regulate to create a very low mount version of their 4×32 BROWE Tactical Optic (BTO) specifically designed to work with the RS Regulate AK-302 Rear-Biased Mount and AKOG Upper Mount. Browe calls the optic the BTO-005G-RS and, in addition to the redesigned low mount, it will also feature a 7.62×39 specific BDC reticle that is green illuminated and powered by a CR123A battery. 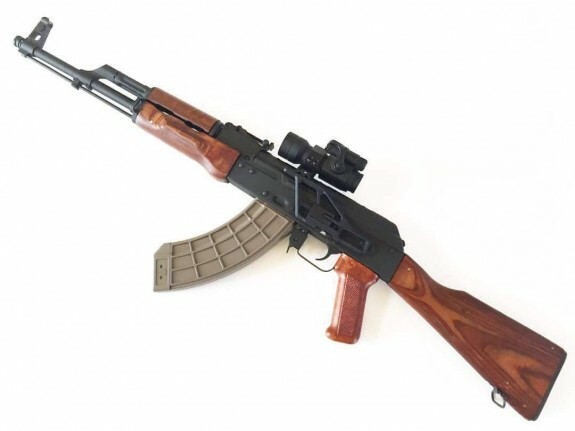 The result of this collaboration is a magnified optic package that goes a long way toward mitigating the eye relief issues and excessive height over bore issues typically seen with magnified optics on the AK. It is is also far more trim than you would expect from an AK optic. 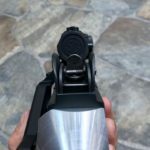 The entire package including the mount weighs just 18.8 ounces which is incredible considering that many magnified optics can weigh 18 ounce or more before you add the weight of the mount. This optic package still allows field stripping when installed. The time is right for a well thought out optic package like this. There are increasingly accurate AKs coming to market from the likes of DDI and others. It is about time there was a well thought out and modern magnified optic package that could take advantage of the increased accuracy. You can learn more about this collaboration at Browe-Inc.com. There was a time when I would have said that side optics mounts on AKs were not really a viable solution or at least they had been surpassed in usefulness by other options. They didn’t work well with modern optics, they were heavy, they might not center the optic over the bore, they often had excessive height over bore, and they were very clunky in general. RS Regulate changed all that with the introduction of their original AK side mounts. Later, with the release of their improve AK-300 series mounts, they cemented their place as the best AK optic mounting solution. The AK-300 series mount system consists of upper and lower mount components. 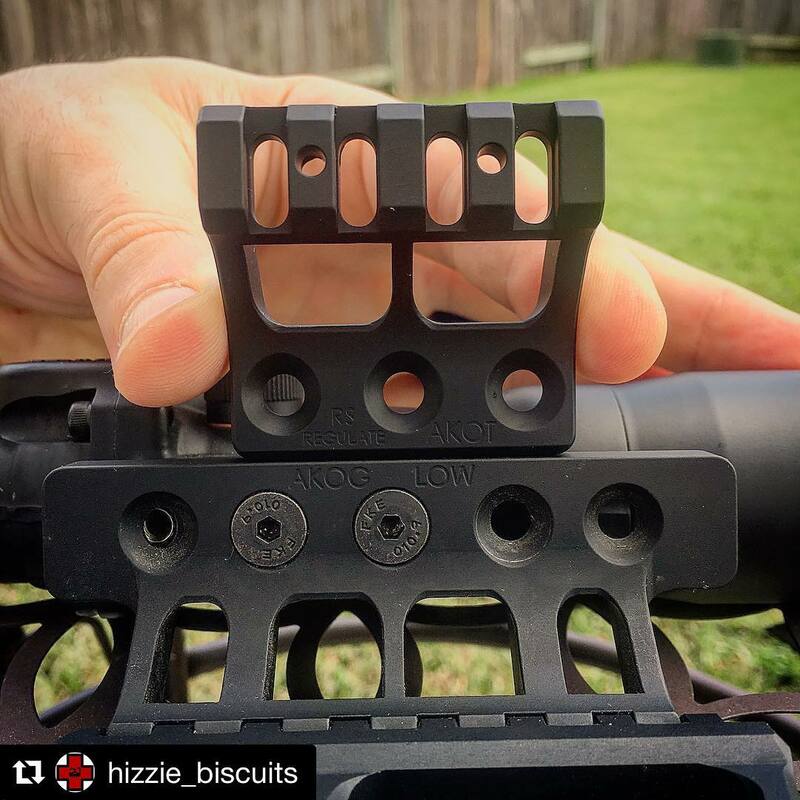 Basically, you select a lower mount based on your rifle or placement preference (forward or rear) as this is the part that interfaces with the side optic rail. The upper mount components is dictated by your optic and attached to the lower mount. You need both in order to attach an optic. 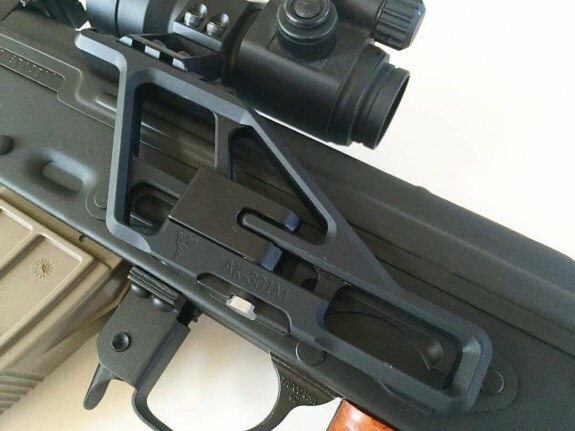 The lower mount attaches to your AK side rail and is available in several configurations. The AK-301 (the most common lower mount) fits most AKM rifles with side rails and allows optics to be place in a more forward position. The AK-302 (the subject of this review) fits most AKM rifles with side rails and allows the optic to be placed more to the rear of the rifle. 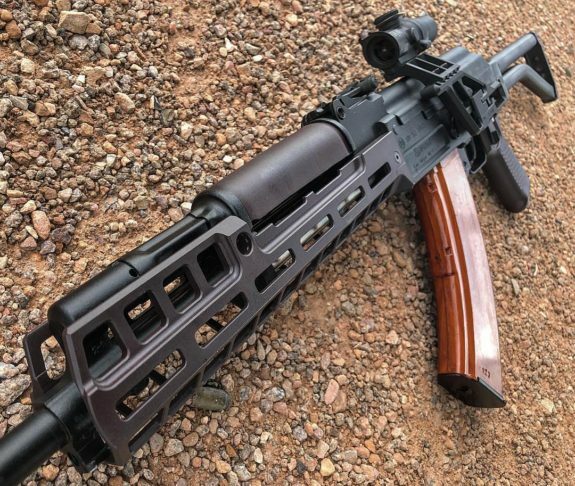 The AK-303 is the same as above but with a full length rail that allows for a variety of placement or for use with longer optics. There are also other lower mounts available for other rifles like the VZ.58, Yugos, PSLs, and more. The upper mounts are available to interface with a variety of optics. 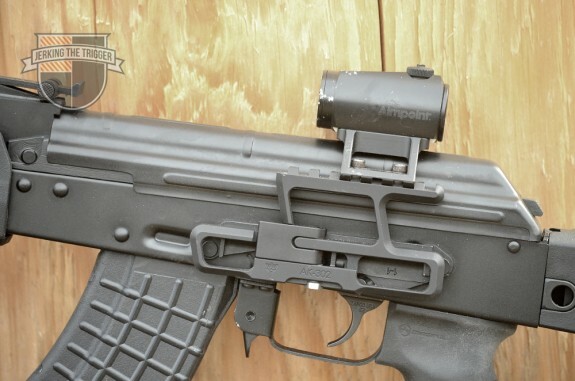 This review will utilize the AKML upper mount to mount an Aimpoint Micro (R1). 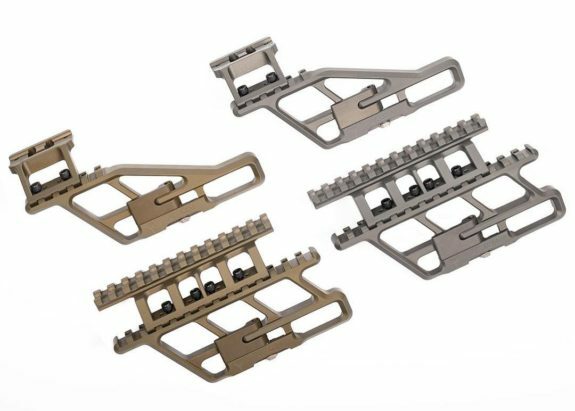 Both the upper and lower components of the AK-300 series mounts are machined from 6061-T6 aluminum and are hard anodized for durability. The locking lever is adjustable without tools and installs easily. The optic mounting location can be adjusted forward/back and side-t0-side to center the optic over the bore. Once the user is happy with how the optic is centered, they can choose to pin the upper and lower mounts together with supplied pins. The mounts sit low enough to allow a 1/3 co-witness when used with most red dot sights. In some configurations, the dust cover can still be removed for cleaning with the mount installed. I have been trying mounting Aimpoint Micros closer to the eye in order to acquire the dot sooner and more easily from awkward positions (there may be an article on this later). That is why I chose the AK-302 lower mount for use with my DDI Zhukov. The AK-302 is RS Regulate’s “rear-biased” mount that allows the optic to be place further to the rear of the receiver. This configuration works well for me with one caveat. Mounting the optic to the rear ON MY PARTICULAR RIFLE does not allow the dust cover to be removed with the mount in place. It repeats zero well enough that this is a non-issue for cleaning/maintenance but does add another step to certain types of malfunction clearances that may require removing the dust cover. I have tested it with 3 other AKs in my collection and it allows the dust cover to be removed. 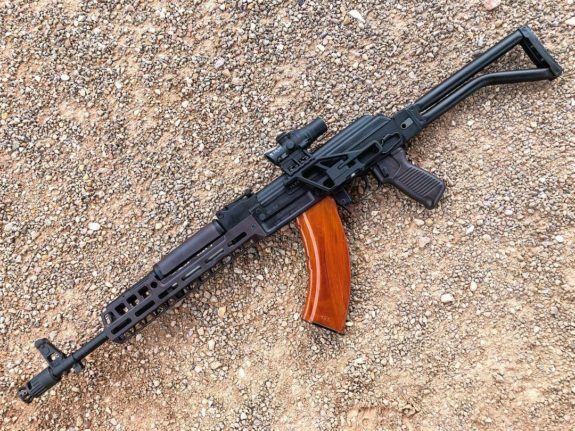 I suspect that the AK-301 forward-biased mount would allow field stripping on this particular rifle and I plan to try that as funds allow. The repeat zero capability for this mount is more than sufficient for its intended purpose. I have taken it on and off my AK countless times during the review process and the zero has never wondered outside of what is noticeable on an AK with a red dot sight. That said, this has spent most of its time mounted on a DDI that is impressive in its accuracy and there has been no discernible shift. Durability seems to be excellent. While taking pictures for this review, the rifle fell off a wood pile that I was photographing it on. It tumbled all the way down the pile and hit the optic and mount several times with scratches and pine pitch to prove it. There was no bending or breaking. I confirmed that the dot still co-witness with the sights and have since shot it several times on paper. There was no loss of zero. The weight on these mounts is nothing short of amazing. The upper and lower mount combined weigh in at a scant 3.25 ounces. That is actually less than RS Regulate advertises and within about a quarter ounce of typical AR-15 mounts for Aimpoint Micros. It’s light weight and placement over the receiver means that it basically has no effect on the handling of the AK. The scale will tell you its there but when you are actually shooting your rifle, there is no discernible effect on the balance of the rifle. It is also impressive how low profile this mount is. The QD lever sits flush with the mount itself. The entire setup adds very little thickness to the AK itself. On top of that, RS Regulate was careful about ensuring that all corners were beveled which further enhances just how svelte the mount feels. The stars have really aligned for RS Regulates mounts. 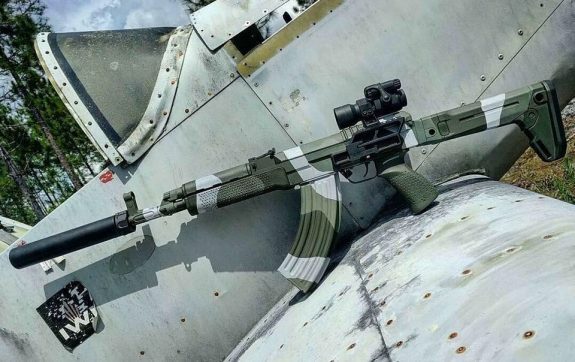 They have a quality that stands on its own but with the arrival of a quality, readily available right-side folding stock (Magpul Zhukov), it makes more sense than ever to give one of these a try. Having a folding stock that will fold with the mount in place removed one of the final barriers for me to try a side mount. In my experience, the RS Regulate AK-300 series mounts are the finest optic mounts available for the AK family of rifles. They repeat zero, hold up to abuse, work with today’s best optics, place the optic low enough to co-witness with your iron sights, allow field stripping without being removed in most cases, and weigh very little. I am done burning my fingers on railed gas tube replacement type optic mounts. 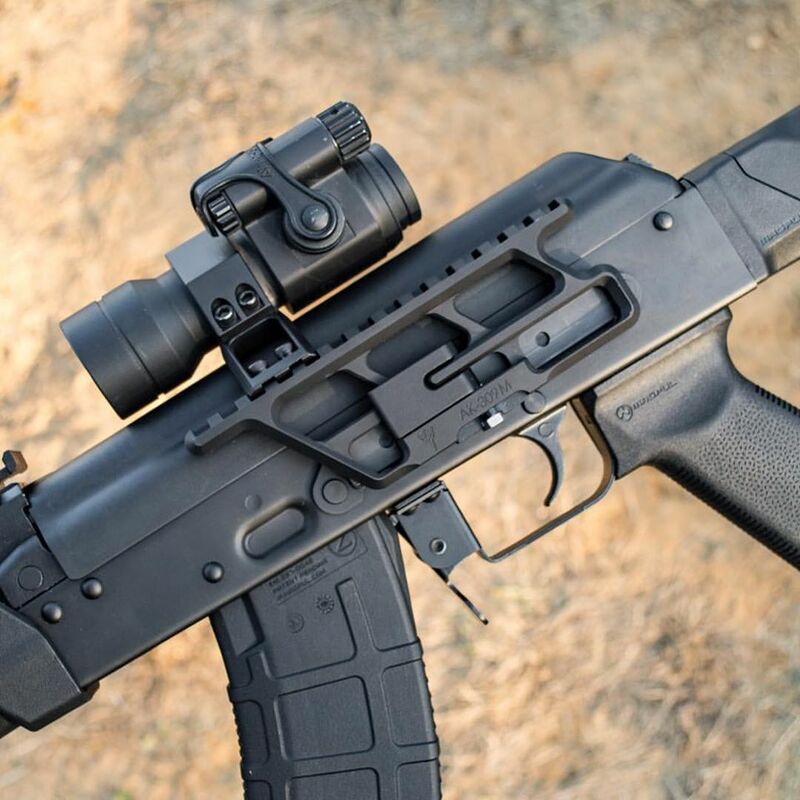 Check out RS Regulate’s website to find the right mount for your AK and optic combination. There was a time when I would have said that AK side optic mounts were basically dead. They were usually poorly made, interfered with side folding stocks, may not have centered the optic over the bore, and were heavy. 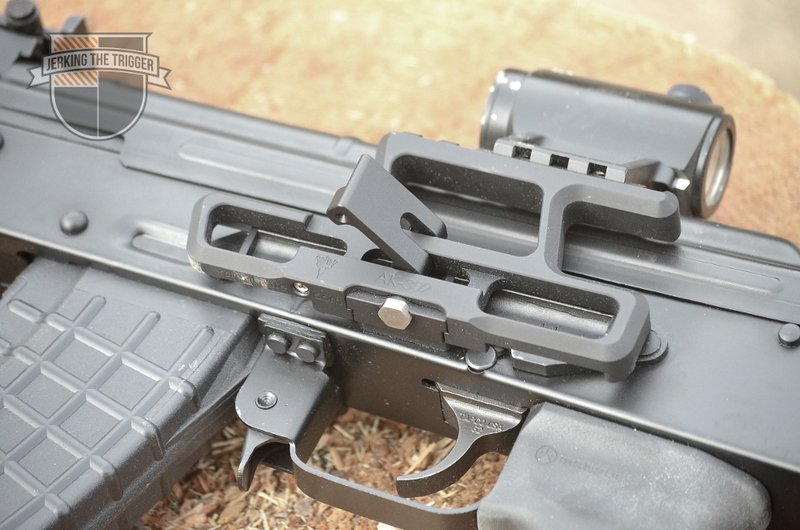 Then RS Regulate came along and turned the entire AK optic mount on its ear with their original side mounts. Their quality was second to none, they allowed the user to center the optic over the bore, were lighter than just about anything similar, and they had truly excellent ability to repeat zero. 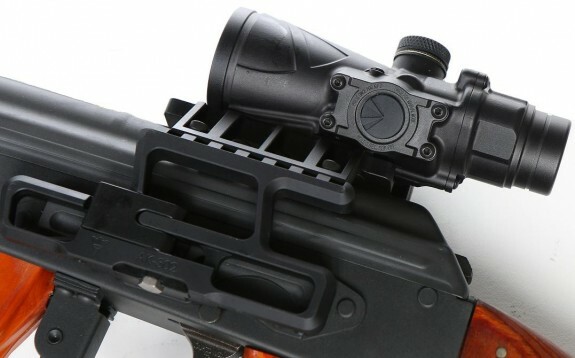 RS Regulate would go on to further revolutionize AK side optic mounts with the introduction of their AK-300 series mounts (which replaced previous versions). These mounts were lighter than ever (lighter than they advertise), bull-strong, and featured an improved low-profile throw lever. 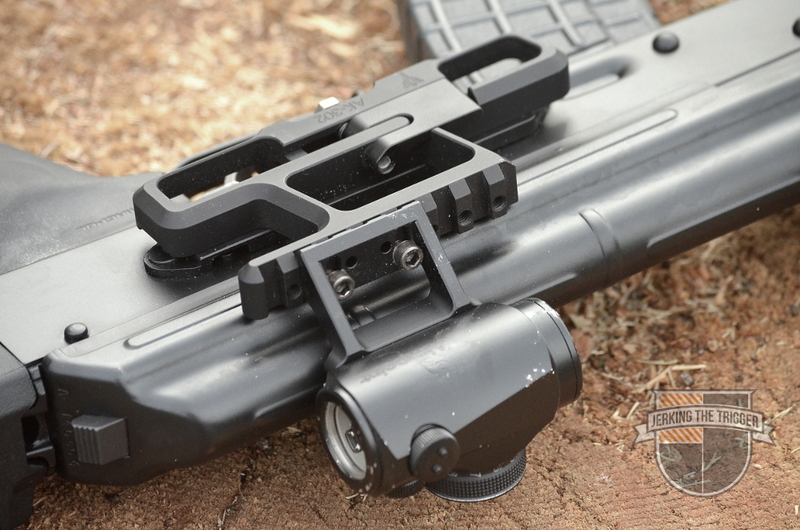 These were perhaps the best AK optic mounting solution available… until now. They have further pushed the evolution of the AK side optic mount with the introduction of the AK-301M. This replaces the AK-301 lower mount which is their furthest forward mounting solution which is ideal for red dot sights. The AK-301M’s design allows it to be lighter and more rigid than the legacy AK-301 lower mount. It is backwards compatible with all of the upper optic specific mounts like the AKML (Aimpoint Micro), AKM (30mm RDS), etc. In spite of the overall improvement, the mount’s price remains the same. You can expect other RS Regualte AK-300 series lower mounts to receive a similar treatment over time as they move toward this second generation form. The AK-301M has already shipped to dealers will be available at retailers any moment now.